The family fun day at Bishopscourt Racetrack organised the Mustard Seed Group and local residents was well supported with a good crowd basking in the summer sunshine. 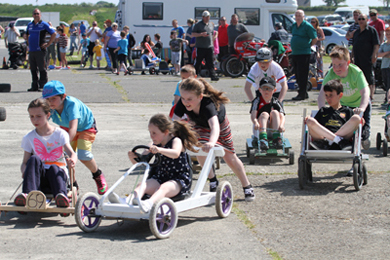 Action in the Ballyhornan fun day cart races. The event organisers were delighted with the turnout and Geraldine Doherty-Mullan said: “This is just fantastic. This is the first time we have organised one of these events and it has generally gone very well. We are fundraising for the local Mustard Seed Group and other local charities. There was a wide range of activities to suit all ages from a car boot sale, a soccer match, knobbly knee competition, a Best Tarzan, carting and bicycle races, ponies and traps, tractors, archery, face-painting, static displays of F1 cars and some motorbikes, raffles, stalls, catch a duck, tombolas, ice cream and tasty hot food and more. 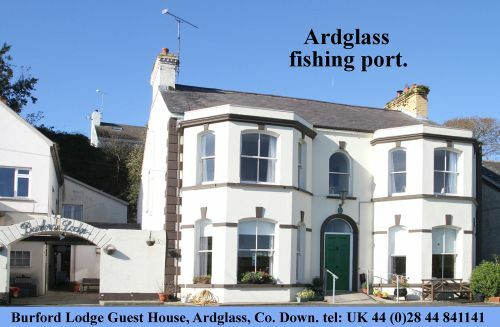 As the Ballyhornan community grows together and addresses its many local issues, it is showing signs of having a good community development approach with good cross-community involvement and including many people in the community in different ways. But earlier in the day there was a flap as someone had maliciously posted a message on Facebook that the event had been cancelled. The last thing the organisers needed. This event was a great mid-summer tonic for the local community.